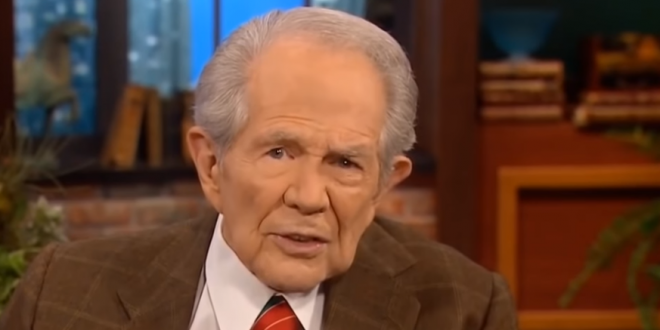 Pat Robertson: The DOJ Needs To Serve A Warrant On George Soros For Financing Migrant Caravan [VIDEO] - Joe.My.God. “It’s going to be a public relations nightmare for our president if he doesn’t get ahead of this thing. The person who has apparently been financing this thing is George Soros. Now, we don’t have hard evidence on that, but that’s the suspicion; that the George Soros foundation has somehow been providing money because somebody has been paying those people off. My suggestion is that the Justice Department needs to get a warrant to search the books of the Soros foundation to see if indeed they have been setting this thing up. The whole idea was to use these people to embarrass the president just before the election.” – Pat Robertson, speaking today on the network he owns.